Ollie has caught World Cup Fever! It is nice to be back in the tropics (18 degrees south latitude) of Santa Cruz, Bolivia and seeing the lush vegetation, especially palm trees again! I have much nostalgia for this place because this is where Nadia and I fell in love! Seeing all of the places brings back specific memories of our courtship. The fall of 1997 until the spring of 1999 will always hold a special place in my heart. I spent a good portion of my life in Latin America (13 years in Colombia, Bolivia, and Venezuela) and as I get older, I like Latin America in only small doses. We come here to be with Nadia’s father, Hermes, who is a wonderful host and the best father-in-law one could ask for, so it always makes our trip enjoyable, not only for me and Nadia, but for our children to spend time with their beloved grandfather, as they affectionately call, Popa. I don’t think we would come here if it was not for him. Santa Cruz is the richest city in Bolivia and the capital of the eastern lowlands section of the country. The people in this, and neighboring departments, are known as Cambas and it has a distinct culture and feel. It is more similar to the culture of Paraguay than the altiplano Bolivia, but slowly, the city is being taken over by Andino immigrants. I am always impressed with the rapid progress commercially and economically Santa Cruz is making. Every time we visit there are more businesses, highways, housing estates, especially on the other side of the River Pirai. The city has changed much since we last lived here 15 years ago. Santa Cruz has a unique cuisine with its Amazonian/Chaco fruits and native dishes. I will be blogging on life here for the next week and a half and will be featuring several of these foods. The first is the most refreshing fruit juice I have tasted, Lima. The lima is a member of the citrus family but I am not sure what is the species or variety. As you can see in the photo below, it is yellow in color but looks and feels more like an orange than a lemon. It tastes like a moderately sweet laundry detergent. I know that sounds unpalatable, but it is truly refreshing and different. I would expect the acidic bite of a lemon or orange, but it is really smooth. On a hot day, there is not a better drink than an ice cold lima juice. The fruit juice is made from the peels in a blender. I am posting a video on Youtube. You can also eat the fruit itself and it has a more bland sweetness than detergent taste. In trying to figure out the species, I did a quick search on the internet and my research is inconclusive. In the supermarket, there are several kinds of lemons/limes. 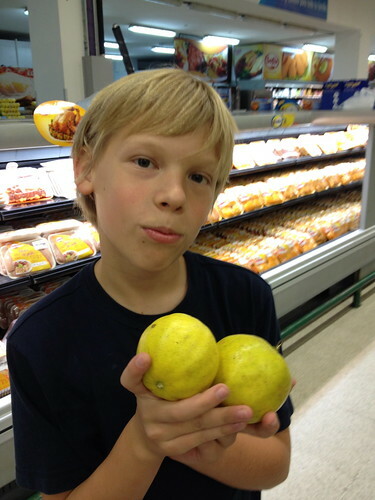 That is another issue is the Spanish translation for both lemon and lime is limón. Some think that it is the Palestine Sweet Lime, but I would like for an expert to tell me. Latin America has not changed with its sexist advertising, as you can see below in this advertisement at the local supermarket. Tomorrow is the Feast of San Juan, traditionally known as the coldest night of the year. San Juan is the patron saint of the nearby village of Porongo, and people in Santa Cruz celebrate the event with roasting hot dogs (salchicha). I will make a BBQ tomorrow night for the kids and we might even shoot off some fireworks. 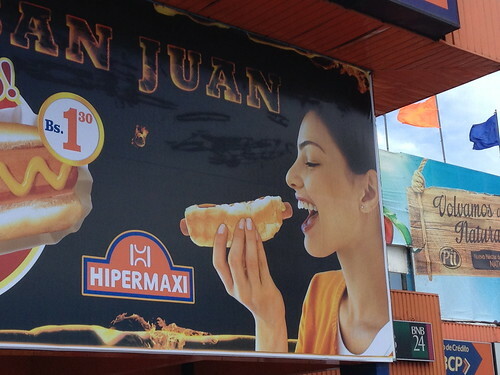 The sexually suggestive advertising does not offend me, but I would like to see a bit more intelligent and creative advertising than the same old woman ready to swallow a hot dog. Finally, I went for a run this morning with Hermes’s dog, Lulu, We enjoyed the run, but I am disappointed in the design of cities here in Bolivia and throughout Latin America. They are not made for runners or bikers. The sidewalks in Santa Cruz are the responsibility of the individual land owners, not the city, so they are not uniform and have many elevations, making it impossible to ride a bike. It would also be dangerous to ride a bike with the amount of traffic and the disregard for traffic laws in many of the drivers here. There are no designated bike lanes or paths. There are many parks, however, they are self contained and more in the Spanish design of sitting on benches with semi-manicured gardens and very small walking loops around the park. There are many gorgeous mango trees that provide shade. As regular readers of my blog know, a big criteria I judge cities is in the quantity and quality of bike/running areas. Santa Cruz would be very low on that account. It is really nice to be on holiday with the kids. We are totally into the World Cup, watching the games and then playing in the cancha in front of Popa’s house.